Product #20839 | SKU SAXP360B | 0.0 (no ratings yet) Thanks for your rating! The Samson Technologies Expedition Express Portable PA Speaker is an all-in-one battery-powered speaker that can be paired with your smartphone, laptop, or tablet, thanks to Bluetooth support. You can play your music at parties, presentations, and classrooms without any need for cables. Delivering pure, full-range sound, Expedition Express employs a 2-way speaker design with a 6" woofer and a 1" high-frequency driver. The unit also features a 3-channel mixer with XLR (for microphones), 1/4" (for guitar and line-level devices), and 1/8" (for MP3 players) input options. To expand your sound system, the unit has a link output that allows you to cascade multiple systems together. In addition, a master 2-band EQ (bass and treble control) allows you to adjust the sound to match the specific setting and audience. Expedition Express is lightweight and even features a convenient integral top carry handle. These features, along with its internal rechargeable battery that allows for 8 hours of continuous use, let you bring the portable speaker almost anywhere. In addition to a variety of indoor events, the Expedition Express Portable Speaker is ideal for outdoor functions such as pool parties, backyard barbeques, beach hangouts, and more. Whether you’re using it as a more practical alternative to the megaphone or engaging Bluetooth to control the music from across the room, Expedition Express functions equally well. 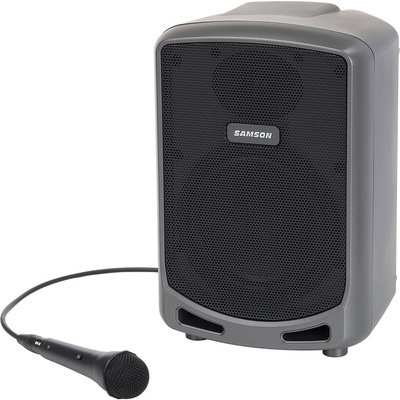 The speaker is well-suited for directing small ensembles and practice groups. Thanks to its XLR-1/4" combo, 1/4" and 1/8" inputs, students can practice along with keyboards, drum machines, MP3/CD players and other line level devices. And, by playing back these external devices, the speaker makes the analysis of recorded music easier and a more interactive experience. Expedition Express together with an acoustic guitar makes for an ideal combo for practice, as well as small coffee house gigs and jam sessions. Wherever creativity strikes you, simply plug your guitar into the speaker’s 1/4" input and you’ll be ready to give a solid acoustic performance. As a portable acoustic guitar amplifier, Expedition Express can be taken almost anywhere along with your guitar. The high-quality components, versatile features and convenient portability make it a must-have speaker for virtually any recreational application.